Marcus Aurelius (121 – 180 AD) was Roman Emperor from 161 to 180. He ruled with Lucius Verus as co-emperor from 161 until Verus’ death in 169. He was the last of the Five Good Emperors, and is also considered one of the most important Stoic philosophers. Antonio de Guevara (c. 1481 – 1545) was a Spanish chronicler and moralist. Title: Vita di M. Aurelio Imperadore [by A. de Guevara], con le alte et profonde sue sentenze, notabili documenti, ammirabili essempi, e lodevole norma di vivere, tradotta di Spagnuolo in lingua Toscana, per M. Roseo da Fabriano. Nuovamente ristampata, & dal medesimo auttore … da nuovo riconosciuta. Published: Stampata in Vinegia : [s.n. ], 1543. Publisher: Stampata in Vinegia : [s.n. ], 1543. Marcus Aurelius (/ɔːˈriːliəs/; Latin: Marcus Aurelius Antoninus Augustus;[notes 1] 26 April 121 – 17 March 180 AD) was Roman Emperor from 161 to 180. He ruled with Lucius Verus as co-emperor from 161 until Verus’ death in 169. He was the last of the Five Good Emperors, and is also considered one of the most important Stoic philosophers. During his reign, the Empire defeated a revitalized Parthian Empire in the East: Aurelius’ general Avidius Cassius sacked the capital Ctesiphon in 164. In central Europe, Aurelius fought the Marcomanni, Quadi, and Sarmatians with success during the Marcomannic Wars, although the threat of the Germanic tribes began to represent a troubling reality for the Empire. A revolt in the East led by Avidius Cassius failed to gain momentum and was suppressed immediately. The major sources for the life and rule of Marcus Aurelius are patchy and frequently unreliable. 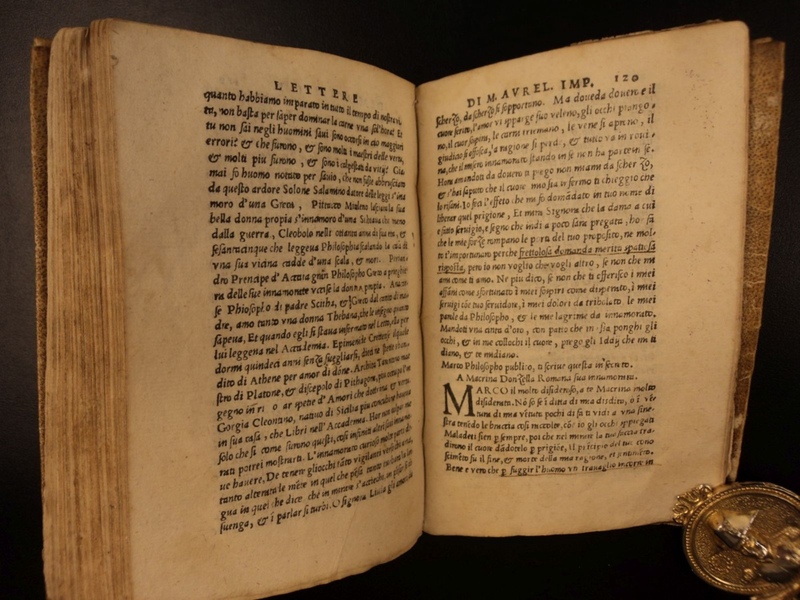 The most important group of sources, the biographies contained in the Historia Augusta, claim to be written by a group of authors at the turn of the 4th century, but are in fact written by a single author (referred to here as “the biographer”) from the later 4th century (c. 395). The later biographies and the biographies of subordinate emperors and usurpers are a tissue of lies and fiction, but the earlier biographies, derived primarily from now-lost earlier sources (Marius Maximus or Ignotus), are much more accurate. For Marcus’ life and rule, the biographies of Hadrian, Antoninus Pius, Marcus and Lucius Verus are largely reliable, but those of Aelius Verus and Avidius Cassius are full of fiction. A body of correspondence between Marcus’ tutor Fronto and various Antonine officials survives in a series of patchy manuscripts, covering the period from c. 138 to 166. Marcus’ own Meditations offer a window on his inner life, but are largely undateable, and make few specific references to worldly affairs. The main narrative source for the period is Cassius Dio, a Greek senator from Bithynian Nicaea who wrote a history of Rome from its founding to 229 in eighty books. Dio is vital for the military history of the period, but his senatorial prejudices and strong opposition to imperial expansion obscure his perspective. Some other literary sources provide specific detail: the writings of the physician Galen on the habits of the Antonine elite, the orations of Aelius Aristides on the temper of the times, and the constitutions preserved in the Digest and Codex Justinianus on Marcus’ legal work. Inscriptions and coin finds supplement the literary sources. Marcus’ family originated in Ucubi, a small town southeast of Córdoba in Iberian Baetica. The family rose to prominence in the late 1st century AD. Marcus’ great-grandfather Marcus Annius Verus (I) was a senator and (according to the Historia Augusta) ex-praetor; in 73–74, his grandfather, Marcus Annius Verus (II), was made a patrician. [notes 2] Verus’ elder son—Marcus Aurelius’ father—Marcus Annius Verus (III) married Domitia Lucilla. Lucilla was the daughter of the patrician P. Calvisius Tullus Ruso and the elder Domitia Lucilla. The elder Domitia Lucilla had inherited a great fortune (described at length in one of Pliny’s letters) from her maternal grandfather and her paternal grandfather by adoption. The younger Lucilla would acquire much of her mother’s wealth, including a large brickworks on the outskirts of Rome—a profitable enterprise in an era when the city was experiencing a construction boom. Lucilla and Verus (III) had two children: a son, Marcus, born on 26 April 121, and a daughter, Annia Cornificia Faustina, probably born in 122 or 123. Verus (III) probably died in 124, during his praetorship, when Marcus was only three years old. [notes 3] Though he can hardly have known him, Marcus Aurelius wrote in his Meditations that he had learned “modesty and manliness” from his memories of his father and from the man’s posthumous reputation. Lucilla did not remarry. Portrait of Emperor Marcus Aurelius – Palazzo Nuovo (Musei Capitolini). Lucilla, following prevailing aristocratic customs, probably did not spend much time with her son. Marcus was in the care of “nurses”. Even so, Marcus credits his mother with teaching him “religious piety, simplicity in diet” and how to avoid “the ways of the rich”. In his letters, Marcus makes frequent and affectionate reference to her; he was grateful that, “although she was fated to die young, yet she spent her last years with me”. After his father’s death, Aurelius was raised by his paternal grandfather Marcus Annius Verus who, according to Roman Law, had always retained the “patria potestas” over his son and grandson. Technically this was not an adoption, since an adoption would be the legal creation of a new and different “patria potestas” (II). Another man, Lucius Catilius Severus, also participated in his upbringing. Severus is described as Marcus’ “maternal great-grandfather”; he is probably the stepfather of the elder Lucilla. Marcus was raised in his parents’ home on the Caelian Hill, a district he would affectionately refer to as “my Caelian”. It was an upscale region, with few public buildings but many aristocratic villas. Marcus’ grandfather owned his own palace beside the Lateran, where Marcus would spend much of his childhood. Marcus thanks his grandfather for teaching him “good character and avoidance of bad temper”. He was less fond of the mistress his grandfather took and lived with after the death of Rupilia Faustina, his wife. Marcus was grateful that he did not have to live with her longer than he did. A new set of tutors—Alexander of Cotiaeum, Trosius Aper and Tuticius Proculus[notes 4]—took over Marcus’ education in about 132 or 133. Little is known of the latter two (both teachers of Latin), but Alexander was a major littérateur, the leading Homeric scholar of his day. Marcus thanks Alexander for his training in literary styling. Alexander’s influence—an emphasis on matter over style, on careful wording, with the occasional Homeric quotation—has been detected in Marcus’ Meditations. In late 136, Hadrian almost died from a haemorrhage. Convalescent in his villa at Tivoli, he selected Lucius Ceionius Commodus as his successor, and adopted him as his son. The selection was done invitis omnibus, “against the wishes of everyone”; its rationale is still unclear. As part of his adoption, Commodus took the name Lucius Aelius Caesar. After a brief stationing on the Danube frontier, Aelius returned to Rome to make an address to the senate on the first day of 138. The night before the speech, however, he grew ill, and died of a haemorrhage later in the day. [notes 5] On 24 January 138, Hadrian selected Aurelius Antoninus as his new successor. After a few days’ consideration, Antoninus accepted. He was adopted on 25 February. As part of Hadrian’s terms, Antoninus adopted Marcus and Lucius Verus, the son of Lucius Aelius. By this scheme, Lucius Verus, who was already Hadrian’s adoptive grandson through his natural father, remained Hadrian’s adoptive grandson through his new father. The adoption of Marcus Aurelius was probably a suggestion of Antoninus himself, since the former was the nephew of the later’s wife and would be his favorite son. Marcus became M. Aelius Aurelius Verus; Lucius became L. Aelius Aurelius Commodus. At Hadrian’s request, Antoninus’ daughter Faustina was betrothed to Lucius. Marcus was appalled to learn that Hadrian would become his adoptive grandfather. Only with reluctance did he move from his mother’s house on the Caelian to Hadrian’s private home. After a series of suicide attempts, all thwarted by Antoninus, Hadrian left for Baiae, a seaside resort on the Campanian coast. His condition did not improve, and he abandoned the diet prescribed by his doctors, indulging himself in food and drink. He sent for Antoninus, who was at his side when he died on 10 July 138. His remains were buried quietly at Puteoli. The succession to Antoninus was peaceful and stable: Antoninus kept Hadrian’s nominees in office and appeased the senate, respecting its privileges and commuting the death sentences of men charged in Hadrian’s last days. For his dutiful behavior, Antoninus was asked to accept the name “Pius”. Immediately after Hadrian’s death, Antoninus approached Marcus and requested that his marriage arrangements be amended: Marcus’ betrothal to Ceionia Fabia would be annulled, and he would be betrothed to Faustina, Antoninus’ daughter, instead. Faustina’s betrothal to Ceionia’s brother Lucius Commodus would also have to be annulled. Marcus consented to Antoninus’ proposal. Antoninus bolstered Marcus’ dignity: Marcus was made consul for 140, with Antoninus as his colleague, and was appointed as a seviri, one of the knights’ six commanders, at the order’s annual parade on 15 July 139. As the heir apparent, Marcus became princeps iuventutis, head of the equestrian order. He now took the name Caesar: Marcus Aelius Aurelius Verus Caesar. Marcus would later caution himself against taking the name too seriously: “See that you do not turn into a Caesar; do not be dipped into the purple dye—for that can happen”. At the senate’s request, Marcus joined all the priestly colleges (pontifices, augures, quindecimviri sacris faciundis, septemviri epulonum, etc. ); direct evidence for membership, however, is available only for the Arval Brethren. Antoninus demanded that Marcus take up residence in the House of Tiberius, the imperial palace on the Palatine. Antoninus also made him take up the habits of his new station, the aulicum fastigium or “pomp of the court”, against Marcus’ objections. Marcus would struggle to reconcile the life of the court with his philosophic yearnings. He told himself it was an attainable goal—”where life is possible, then it is possible to live the right life; life is possible in a palace, so it is possible to live the right life in a palace”—but he found it difficult nonetheless. He would criticize himself in the Meditations for “abusing court life” in front of company. As quaestor, Marcus would have had little real administrative work to do. He would read imperial letters to the senate when Antoninus was absent, and would do secretarial work for the senators. His duties as consul were more significant: one of two senior representatives of the senate, he would preside over meetings and take a major role in the body’s administrative functions. He felt drowned in paperwork, and complained to his tutor, Fronto: “I am so out of breath from dictating nearly thirty letters”. He was being “fitted for ruling the state”, in the words of his biographer. He was required to make a speech to the assembled senators as well, making oratorical training essential for the job. On 1 January 145, Marcus was made consul a second time. He might have been unwell at this time: a letter from Fronto that might have been sent at this time urges Marcus to have plenty of sleep “so that you may come into the Senate with a good colour and read your speech with a strong voice”. Marcus had complained of an illness in an earlier letter: “As far as my strength is concerned, I am beginning to get it back; and there is no trace of the pain in my chest. But that ulcer […][notes 6] I am having treatment and taking care not to do anything that interferes with it.” Marcus was never particularly healthy or strong. The Roman historian Cassius Dio, writing of his later years, praised him for behaving dutifully in spite of his various illnesses. A bust of Faustina the Younger, Marcus’ wife (Louvre). In April 145, Marcus married Faustina, as had been planned since 138. Since Marcus was, by adoption, Antoninus Pius’ son, under Roman law he was marrying his sister; Antoninus would have had to formally release one or the other from his paternal authority (his patria potestas) for the ceremony to take place. Little is specifically known of the ceremony, but it is said to have been “noteworthy”. Coins were issued with the heads of the couple, and Antoninus, as Pontifex Maximus, would have officiated. Marcus makes no apparent reference to the marriage in his surviving letters, and only sparing references to Faustina. Herodes was controversial: an enormously rich Athenian (probably the richest man in the eastern half of the empire), he was quick to anger, and resented by his fellow-Athenians for his patronizing manner. Atticus was an inveterate opponent of Stoicism and philosophic pretensions. He thought the Stoics’ desire for a “lack of feeling” foolish: they would live a “sluggish, enervated life”, he said. Marcus would become a Stoic. He would not mention Herodes at all in his Meditations, in spite of the fact that they would come into contact many times over the following decades. A significant amount of the correspondence between Fronto and Marcus has survived. The pair were very close. “Farewell my Fronto, wherever you are, my most sweet love and delight. How is it between you and me? I love you and you are not here.” Marcus spent time with Fronto’s wife and daughter, both named Cratia, and they enjoyed light conversation. He wrote Fronto a letter on his birthday, claiming to love him as he loved himself, and calling on the gods to ensure that every word he learned of literature, he would learn “from the lips of Fronto”. His prayers for Fronto’s health were more than conventional, because Fronto was frequently ill; at times, he seems to be an almost constant invalid, always suffering—about one-quarter of the surviving letters deal with the man’s sicknesses. Marcus asks that Fronto’s pain be inflicted on himself, “of my own accord with every kind of discomfort”. Fronto never became Marcus’ full-time teacher, and continued his career as an advocate. One notorious case brought him into conflict with Herodes. Marcus pleaded with Fronto, first with “advice”, then as a “favor”, not to attack Herodes; he had already asked Herodes to refrain from making the first blows. Fronto replied that he was surprised to discover Marcus counted Herodes as a friend (perhaps Herodes was not yet Marcus’ tutor), allowed that Marcus might be correct, but nonetheless affirmed his intent to win the case by any means necessary: “…the charges are frightful and must be spoken of as frightful. Those in particular which refer to the beating and robbing I will describe in such a way that they savour of gall and bile. If I happen to call him an uneducated little Greek it will not mean war to the death.” The outcome of the trial is unknown. By the age of twenty-five (between April 146 and April 147), Marcus had grown disaffected with his studies in jurisprudence, and showed some signs of general malaise. His master, he writes to Fronto, was an unpleasant blowhard, and had made “a hit at” him: “It is easy to sit yawning next to a judge, he says, but to be a judge is noble work.” Marcus had grown tired of his exercises, of taking positions in imaginary debates. When he criticized the insincerity of conventional language, Fronto took to defend it. In any case, Marcus’ formal education was now over. He had kept his teachers on good terms, following them devotedly. It “affected his health adversely”, his biographer writes, to have devoted so much effort to his studies. It was the only thing the biographer could find fault with in Marcus’ entire boyhood. Fronto had warned Marcus against the study of philosophy early on: “it is better never to have touched the teaching of philosophy…than to have tasted it superficially, with the edge of the lips, as the saying is”. He disdained philosophy and philosophers, and looked down on Marcus’ sessions with Apollonius of Chalcedon and others in this circle. Fronto put an uncharitable interpretation of Marcus’ “conversion to philosophy”: “in the fashion of the young, tired of boring work”, Marcus had turned to philosophy to escape the constant exercises of oratorical training. Marcus kept in close touch with Fronto, but he would ignore his scruples.